Even at first glance, you’ll instantly see the promise of endless relaxation – but if you look more closely, you’ll also discover numerous details which beckon you to enjoy a prolonged steam bath: luxury teak seats, for example, which can be exchanged for natural stone or porcelain stoneware on request. An elegant hand-held shower and fitted ceiling lights blend harmoniously with the interior, as does also the innovative PSI steam inlet. Further highlights, available on request, include indirect lighting with seamless colour sweeps or our POLAR NIGHT SKY. A place to live, or a place to relax? It’s all one and the same to us. The glass D12 steam room creates a fluid transition between your own personal spa and the rest of your home. But the KLAFS D12 steam room doesn’t merely accommodate itself optically to your home; thanks to its innovative modular design, the cabin size and seating arrangements can also be adjusted to suit. We were delighted to receive design awards for our D12 steam room. But our highest aim is to put a smile on your face. 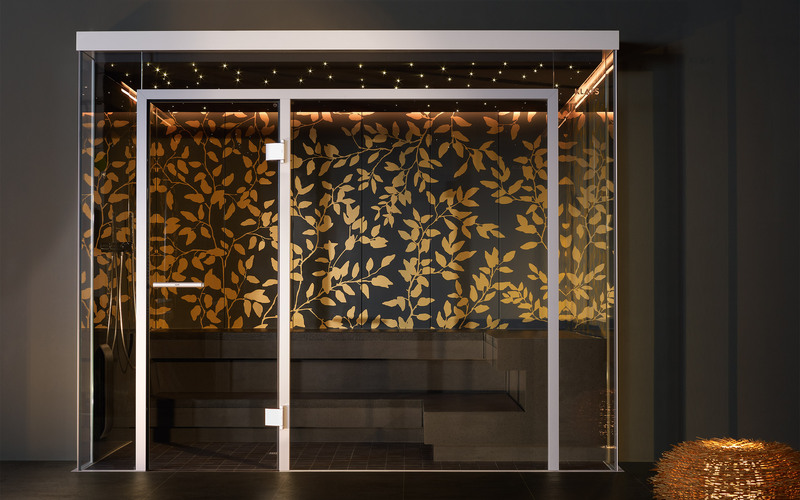 The D12 Oro Nero is a powerful variation of the modular D12 glass steam room, designed by the Henssler & Schultheiss team. Austere geometric shapes and the choice of materials characterise the minimalistic design of this steam room. Glass, aluminium and stone. A gold floral pattern, set against a black background, stands out in stark contrast, giving the D12 Oro Nero a wholly unique character. The D12 Argento Bianco steam room with its silver-blue ornamental elements has a subtle, unobtrusive air thanks to its minimalistic design. This features elegant, geometric structures and materials such as glass, aluminium and stone. 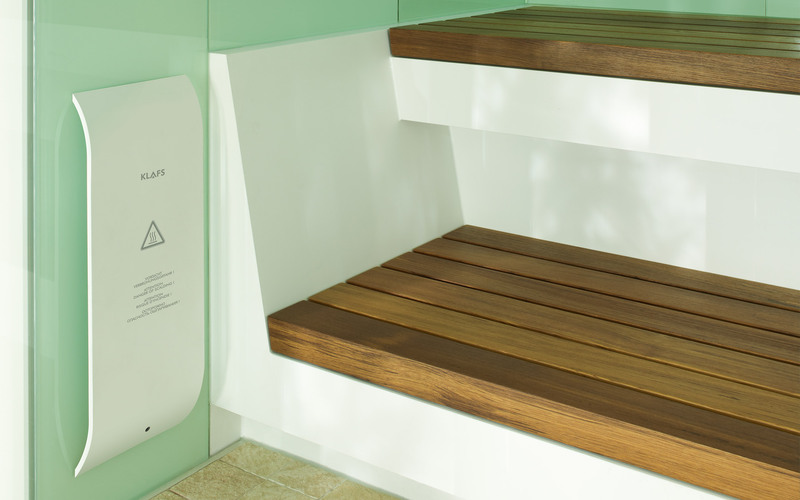 Sauna manufacturer KLAFS was the first company ever to produce a modular steam room suitable for both private and commercial spas. With the new D12 steam room, KLAFS has succeeded in producing the first ever modular steam bath for private and commercial spas to feature walls entirely out of glass. Transparent and elegant, the steam room harmonises gracefully with all spa environments. The detachable luxury teak seat provides a sophisticated contrast of materials. To further complement the innovative steam room design, customers can also opt for porcelain stoneware or natural stone. A canopy of twinkling stars or indirect lighting with seamless colour sweeps transform the steamy interior of the D12 steam room into a place of enchantment.